Early in my gluten-free cooking adventures, I read a website where someone said she got tired of scraping perfectly good filling off of inedible gluten-free pie crusts. However, I had to try. I tried a recipe, and tried another recipe. I tried a mix which other people said was just fine. ICK! Well, then I had an allergy test in which I reacted to rice . . . rice? So for a while, I gave up on baking at all. Until my sweet tooth got the best of me. After a bit of work, I came up with a pie crust recipe which I really love! My 6 yo eats the crust first when I make savory pies for dinner. I roll out leftover crust and cover w brown sugar and eat it like cookies! A few notes: I have been using half crisco shortening, and half fleishman’s unsalted margarine, which is dairy-free. I found that Earth Balance did not make as flaky a crust. However, I can no longer find this margarine! I have been using half regular and half butter-flavored crisco, and that seems to do ok, too. Also, I have not actually used this on a sweet pie yet. I’m not sure why! I THINK it would be fine with a sweet pie, as well. If you try it, please tell me how it worked out! In medium mixing bowl combine flours and starches, guar gum, salt, and sugar. With pastry blender, cut in margarine and Crisco until pieces are pea-size. Do not blend too long, there should still be some visible bits of shortening. Sprinkle lemon juice over the mixture, and toss with a fork. Add water, a tablespoon at a time, until most of the crumbs are sticking to larger bits. Form in to a ball with hands, pressing firmly if needed. If it will not hold together, sprinkle in a bit more water. Cover with plastic wrap and refrigerate for one hour for easier handling. Roll out pastry between 2 pieces of wax paper, dusted w corn starch to reduce sticking. Transfer very carefully as the dough is very fragile. 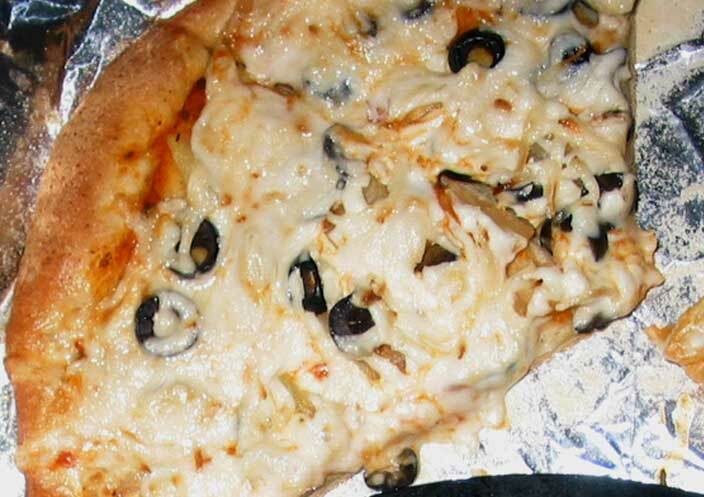 For a baked crust, prick bottom crust with a fork about 5 times. Bake at 400 for 10-15 minutes or until slightly browned. Cool before filling. Cook potatoes – I prefer in the microwave, but you may boil if preferred. 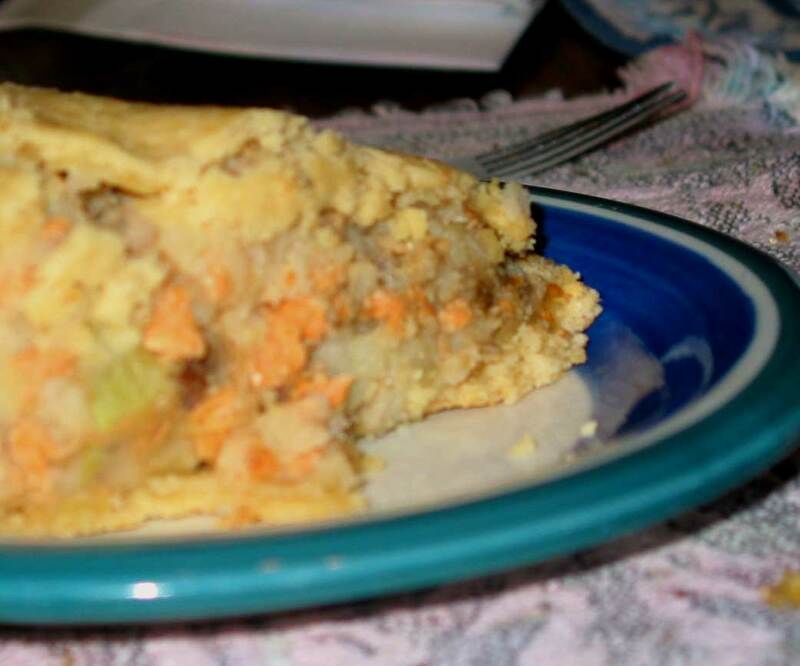 Fill pie crust and top with second crust. Crimp crusts (I use a fork and cut it off that way), and cut slits or poke fork holes in the top. I decided to try to document my dinner plans for the night. Of course, my corn dogs are not only gluten free, but free of dairy, eggs, rice, tapioca . . . who knows what else. And I decided to take pictures. This could be long! When I bake, there are always a lot of different flours. 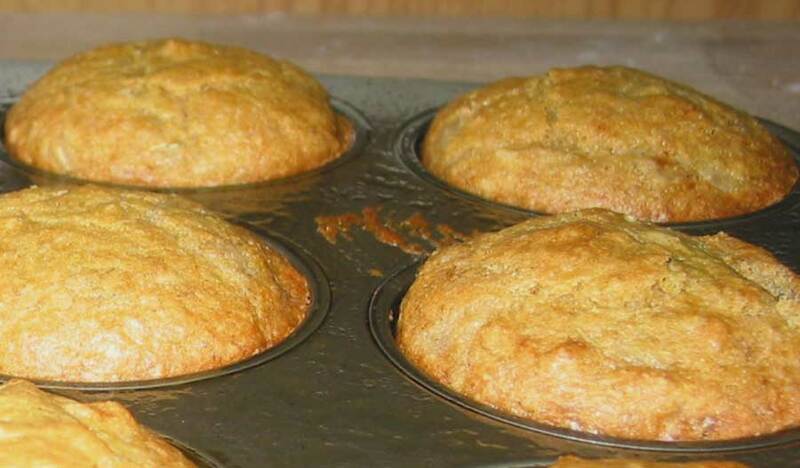 My corn muffin recipe uses fewer than my banana muffin recipe, at least! See, not so bad! Guar gum, in case you are curious, is a substitute for what gluten does for breads – hold it together. Most people use xanthan gum, but I can’t tolerate that. The soy sour cream and soy milk together make my buttermilk substitute. The OJ is mostly for flavor. The gooey stuff in the cup is my egg substitute – flax meal nuked with water. Ooy gooey. We then fold it down the middle. It’s handy to have your hot dogs on the table before you go much further. You have to fold the ends so they close like little canoes, and make sure they are only slightly longer, and maybe 50% taller, than your dogs. Dont make it too long or too wide – your batter will fill the mold, and you don’t want TOO much corn around your dog. Next step is to coat your hot dogs lightly with corn starch. This helps the batter stick to the dogs. I do this with my hands, so each dog is completely coated, but not thick at all. This picture is supposed to show how much batter to put in your corn dog canoe, but instead it is proof positive that I need to learn how to use my camera. I probably threw away half the pics due to flash. So, fill your molds about 1/3 full .. . then you will lightly place your dog on the batter, and lift and rotate the dog to start coating it. I don’t pull the batter all the way around, because that seems to leave the bottom empty. I mostly cover the dog, set it down in the batter, and spoon enough on top (and esp at the ends) so that the dog is completely sealed in. I place the dogs in an oven preheated to 350. I put the remaining batter in to muffin tins and add those to the oven, and set the timer for 20 minutes. When the muffins are done (about 20 minutes, toothpick test or starting to brown), i remove them and turn on my convection fan to hurry up the dogs. They take a lot longer! If you dont have convection, you might want to try baking at a higher temp to start with, and waiting 10 minutes before putting in the muffins. Or, if you aren’t making muffins, bake about 30 minutes! And there they are, 3/4 a dozen muffins and 5 lumpy-looking baked gfcfef corn dogs! Peel the foil carefully off of the dogs. The bottoms should be nicely browned. I tried to take a picture but . . . urg. Flash. Bad Cara. Below is my quirky corn meal muffin. You could probably just use a mix, or your own favorite recipe, if mine looks too strange! mix dry ingredients, add liquids, stir just to mix – lumps are ok. So would you like to know what all that stuff is? 1. Pre-mixed flour for making sandwich bread. This mix is based on a recipes from the book “Gluten Free Baking Classics”, which is cheap and easy to find at amazon. 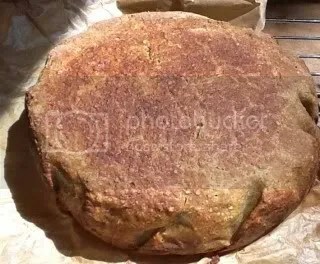 My son can make the bread himself in the breadmaker, as long as I prepare the flour mix and have it on hand. 2. Tapioca Starch is a staple in most gluten-free baking, but it bothers me. 4. 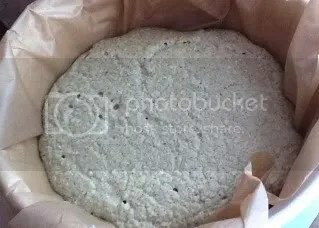 White rice flour: I bought this from the asian market, but my son seems to get sick every time i bake with it, so I’ve stopped using it for the most part. I cant eat it, anyways. 5. Not just grits, but Bob’s Red Mill Gluten Free grits! Yummy with sausage or with canned peaches and sunflower seeds! 6. Quinoa: Since I cant have rice, I often use this instead. Makes wonderful tabouleh! 7. Quinoa flour: a bit bitter, but a great texture. 8. Buckwheat flour: Buckwheat is not related to wheat. My local whole foods started carrying this white buckwheat flour, but I kinda miss the dark buckwheat flour. It had a heavier, nutty flavor .. even tho it did make everything look a dead gray color. 9. Corn starch is quite a staple for me. I havent found a good source of non-gmc corn starch. 11. Corn flour : This has become a real staple for me. It’s a good sub for rice flour in many recipes, except for the strong corn flavor. So I just mix in other flours. 12. Sweet rice flour is really a starch. I get this at the asian market, but it does not seem to bother my son. We mostly use it in the bread mix. 14. Xanthan gum bothers me, so I sub guar gum for most applications – but guar gum does not seem to work as well for yeast bread. 16. Potato starch is a staple in almost all my baking. I wish it wasnt so expensive. 17. A really old bag of store-bought rice flour. this stuff is too coarse for almost anything imo, but the Gluten free Baking Classics recommends using it underneath pizza crust. Flours not shown include almond and coconut, stored in the freezer, sorghum (bothers me, but used in the bread mix), and arrowroot starch, which I use in many places other recipes call for tapioca starch. You can also see glimpses of my sugar, powdered sugar, popcorn, and who knows what else. Gluten-free baking isn’t for the disorganized, I tell you! Although I expect this blog to be mostly about home schooling, i knew I might throw in a bit about our food allergy adventures and my cooking. So since I saw an invite to an allergy blog carnival, i thought i could sneak this in here . . . These banana muffins are not only free of gluten and dairy, they are free of rice, egg, tapioca and xanthan – all things I can’t have yet. And just look, they look like real muffins! 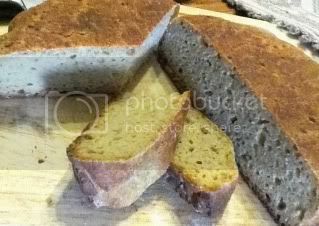 I actually prefer them with a darker buckwheat flour, they come out TOO sweet with the lighter flour. Blend wet ingredients in large bowl. Add dry ingredients and mix well. Bake at 325 in non-stick sprayed muffin tin for 20 minutes or until tooth pick comes out clean (ok, that really means no batter – crumbs are ok!). note: i like to take old bananas and peel them and keep them in the freezer. Take them out and thaw in the microwave, and they become extremely liquidy and easy to cook with.